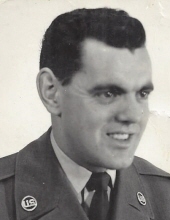 James A. Devlin, age 90 years, of Easton PA., died Monday, April 1, 2019, at St. Luke’s Hospital, Anderson Campus, Bethlehem Township, PA.
Born in Hopewell, NJ, November 17, 1928, son of John Joseph Devlin and Sarah Cannaughton Devlin, Jim had formerly resided in Flemington, NJ for several years and had resided in Easton, PA since 2002. Jim was a United States Air Force Veteran of the Korean War serving in Alaska. He was an office administrator with Public Service Electric & Gas where he was employed for thirty-two years before retiring. Jim was also a member of the Hopewell, NJ American Legion Post. Surviving are his wife, Mary Ann Hindak Devlin; five sons, James A. Devlin, Jr. (Peggi Ann Anderson) of West Trenton, NJ, Jeffrey M. Devlin (Stacy) of Hamilton, NJ, Brian P. Devlin (Linda) of Wirtz, VA, Daniel T. Devlin of Hopewell, NJ and Christopher S. Devlin (Candy) of Yardley, PA; nine grandchildren and one great grandchild. Also surviving are three step-children, June Cimino and Susan Kertesz, both of Flemington, NJ and Paul Lazorisak of Hillsborough, NJ. Funeral services with military honors will be held Wednesday, April 10, 2019, at 1:30 PM in the Holcombe-Fisher Funeral Home, 147 Main Street, Flemington, NJ. Calling hours will be Wednesday April 10, 2019, from 1:00 PM -1:30PM at the funeral home. Interment will be private. "Email Address" would like to share the life celebration of James A. Devlin. Click on the "link" to go to share a favorite memory or leave a condolence message for the family.